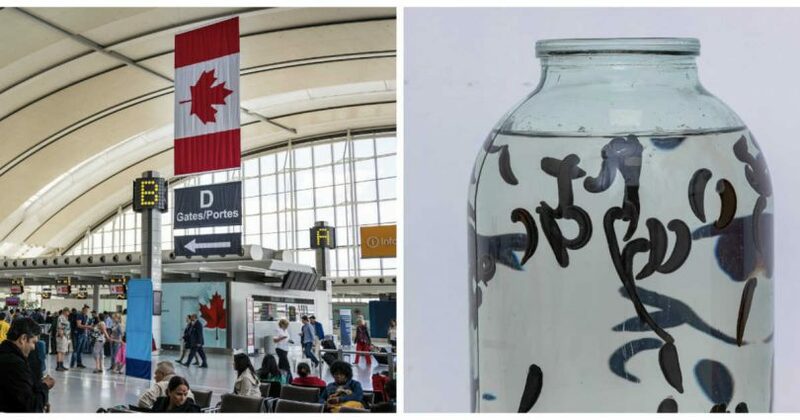 A Canadian man was busted with 5000 parasite leeches in his suitcase at Toronto Pearson Airport. He almost successfully smuggle the weirdest type of illegal contraband that Toronto has seen. But he got intercepted by a dog. He arrived at Toronto Pearson International Airport from Russia on October 17, 2018 with his suitcase filled with 5000 parasite leeches. Thankfully, a Beagle sniffed it out something suspicious in his suitcase and prompted the CBSA (Canada Border Services Agency) staff to search the bag. According to someone from Canada’s environmental department, he said he planned to use them for his orchids at home. These leeches can sell for $10 a pop, which meant that what was in his suitcase was worth $50,000. In addition, according to Nat Geo, the leeches have various medicinal uses which people would pay for, such as treating frostbite and helping with recovery from face lifts. He would have to acquire a specific import-export permit for endangered species if he were to transport them legally. He was charged with illegally importing an internationally regulated species without a permit. His court date had been set for February 15th in the Toronto area. At one point after the CBSA has seized the leeches and was in the process of figuring out what to do with them, about 20 of them escaped which would’ve been a very serious problem if they had attached themselves to a human and feed off their blood. Thankfully they were quickly found and recaptured.